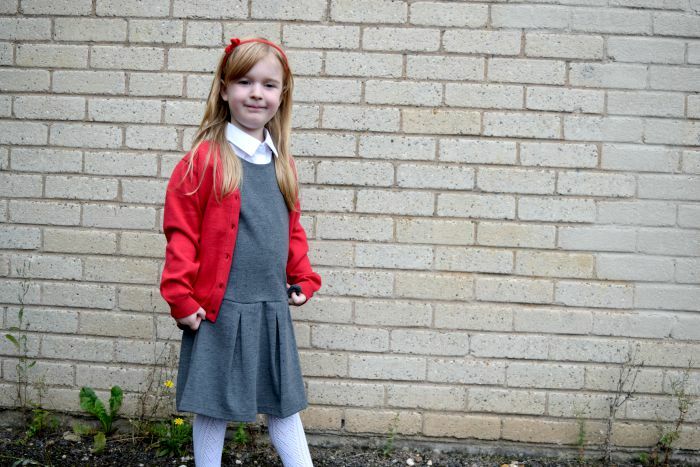 Shopping for school uniform can get very expensive, especially if you have more than one child to buy for. Thankfully, over the last few years, supermarket school uniforms have become more affordable and brilliant quality. Now I find shoes are the only items I have to splash out on and the kids can have three or four sets of uniform making them look clean and smart at all times thanks to the amazing prices. 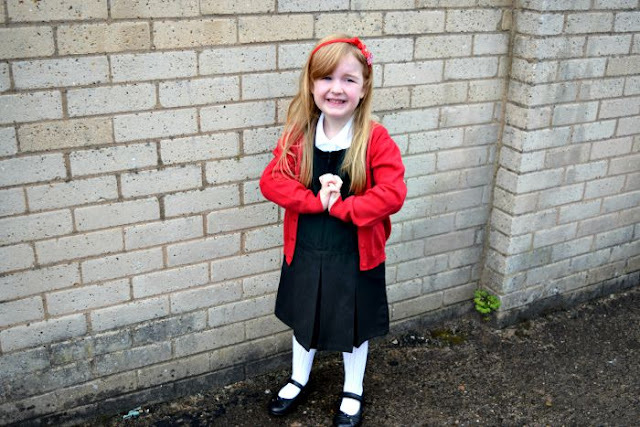 Gracie has been sent a range of items from the Nutmeg back to school range for us to try out. Although Gracie is not 5 until the end of the year, I decided to opt for age 5-6 as she is quite tall for her age and I wanted to make sure her uniform would last. Below you will see three different back to school outfits all modelled by Gracie from the Nutmeg range at Morrisons. I thought Gracie looked really smart in this outfit. The skirt is lovely and thick and Gracie said it was really comfortable. I usually have trouble getting skirts to fit Gracie around the waist but I didn't even need to touch the adjustable waist band on this skirt which is a huge plus. It is great to have the option of an adjustable waist line though as children's body shapes are all so different. The polo shirts are also nice and thick and feel great quality. They have flower shaped buttons to give that extra touch and considering a pack of 2 costs just £2, so £1 per polo shirt, they are an absolute steal! The red cardigan is also really nice, it is well fitted with a lovely neckline that shows off whatever is underneath. It has cute heart shaped buttons which Gracie loves. It looks nice both done up or left open and although it isn't very thick , it also isn't too thin and seems like it will last well. Another nice outfit, I really like Pinafores. They are nice and easy to wash and iron and look really smart with either polo shirts or a nice blouse/shirt. I also find they are great for PE days as they are easy for a small child to put on themselves and still look neat (rather than skirts or trousers with shirts half tucked in!). This was my favourite of the three outfits. The shirts are really smart looking and again, fantastic quality. I really like the style of the shirts and I think they look really nice with the grey pinafore. The pinafore is beautiful and me and Gracie both like the bow detail on the belt area. It feels lovely, soft and comfortable and looks more expensive than £4! I am really impressed so far with the range at Nutmeg. I was amazed at how good the prices are and I am really pleased with the quality and sizing. 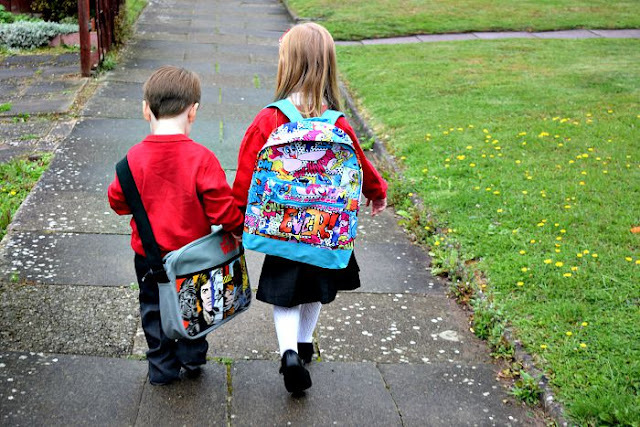 I was disappointed that they actually only start their school uniform at size 4-5 years which means many people with pre-school/nursery aged children would have to shop elsewhere and so I couldn't buy any for Zach from there this year! I would love for them to expand into smaller sizes and I am sure many parents would agree. I have to say I would definitely recommend the Nutmeg back to school range. I was already a fan of their clothing range so I am not surprised at all and I will definitely be heading there when the next school year comes around. 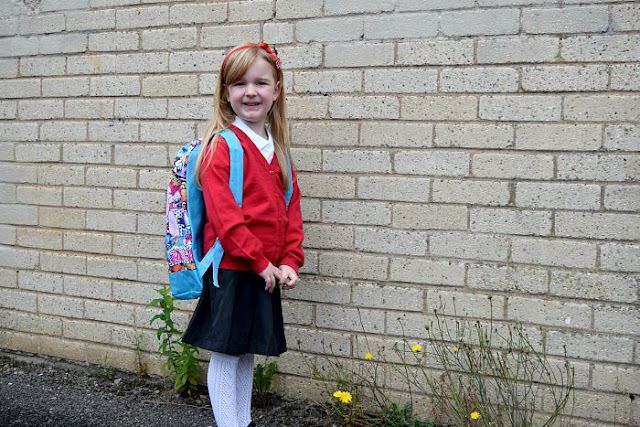 You can find the rest of the Nutmeg back to school range on the Morrisons Website and find your local stockist. We were sent the items featured free of charge for the purpose of this review. All opinions are my own. What a little beautie! Such a reasonable price for uniform too! Thank you. It really is, it makes life so much easier with being able to afford a few sets to keep on top of washing! Great prices. Never heard of these before but will keep them in mind in the future as we go through a lot of uniform! They are the clothing range at Morrisons and they do lovely kids clothing for all ages. Definitely worth a look. We don't have a large Morrisons near us selling Nutmeg, but when the boys were smaller I did get a few pieces and they washed really well. That is a shame. Our local one isn't very big but it has clothing section and I always find nice bits in there. What great sets of uniform. It is great that they are so affordable, accessible but there is also choice too. Yes definitely. I love the extra little touches like the cute buttons and the bows etc. Awww doesn't she look sweet all ready for school. I do think the supermarkets offer great value for money when it comes to uniforms. I know! They both look adorable but I love all the different combinations they have for girls at Nutmeg. Such a smart uniform and it looks great value too. Sweet pictures! I really like Nutmeg clothes. They're good quality without a heavy price tag. Girls Can Be Superheroes Too!